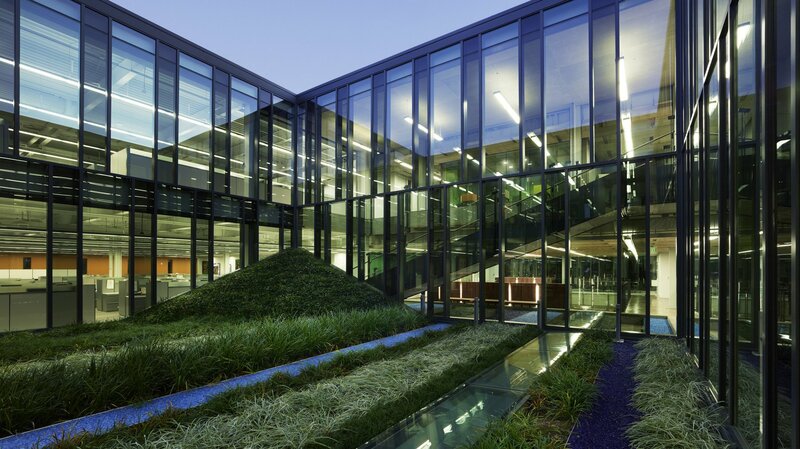 How can we surgically reinvent a dated building to support a company’s mission? This new corporate headquarters for a national outdoor advertising agency is a reaction against the standard issue office environment. 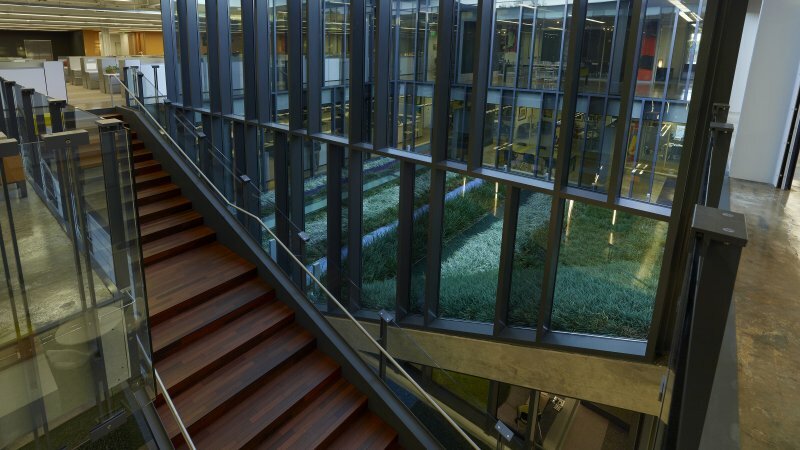 By strategically “coring out” certain structural bays of the existing building, the design connects the independent floor plates into a unified, communicating whole. We began by listening to the leaders describe their vision for the company and their goals for the project. We heard an emphasis on connectivity and collaboration. We heard concerns that their existing office facility seemed to foster fragmentation and factionalism of employees by department rather than the sense of family and community that was so crucial to their culture. 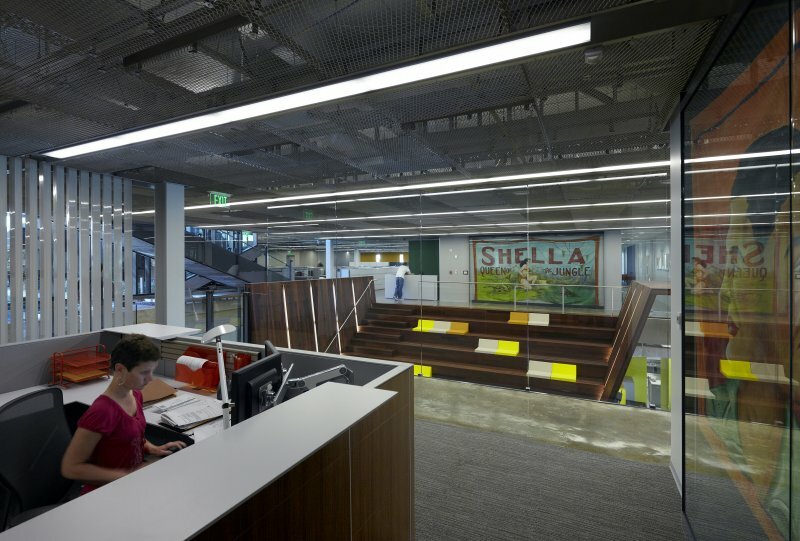 Our design response was to core into and through the building at strategic points to provide floor-to-floor visual relationships, introduce natural lighting, and disrupt the monotony of the oversized floorplates. 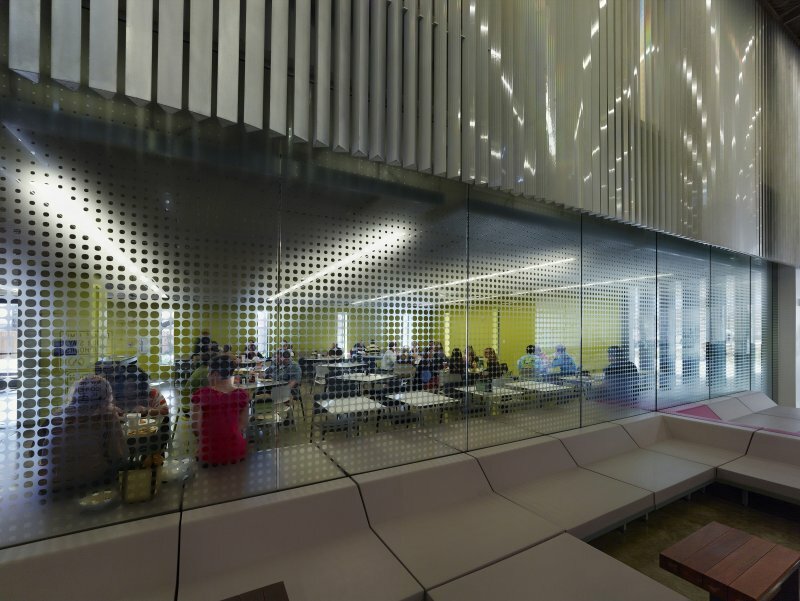 Circulation and space planning were structured around these cores to promote casual interaction and provide informal meeting spaces. Diverging from the obvious solution to strip away and replace the brutalist exterior shell, our proposal was to concentrate the budget resources on amenities that were oriented internally toward the company’s most important asset – its people. Of all the interventions, perhaps the most notable was the one used to bring natural light into the interior of the building. 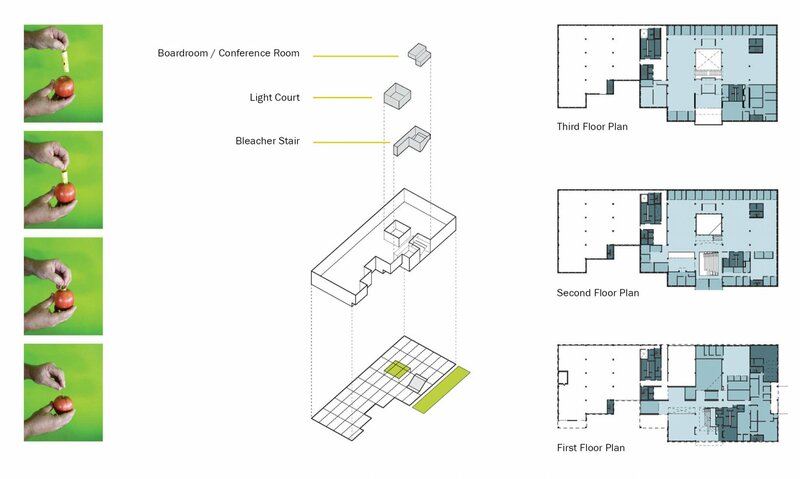 We proposed the insertion of a “light court” that would penetrate to the second floor of the building—an outdoor room that introduced a captured landscape garden. The most sustainable building is the one you don’t tear down. 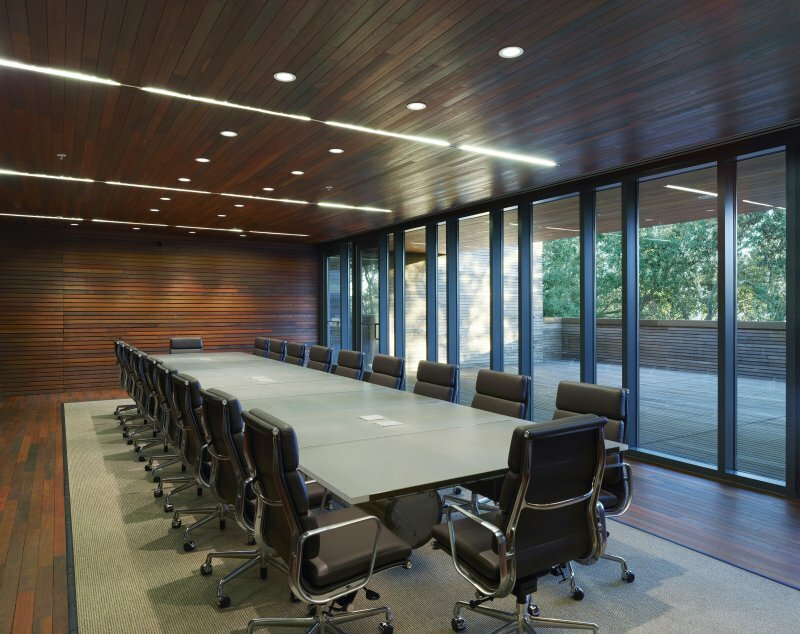 This project demonstrates that you can have a state-of-the-art, attractive facility that builds the creative corporate culture you want, for less than the cost of building new, while avoiding the environmental impact of demolishing an old building. Central to these communicating interventions was the design of a small stadiumstyle seating arrangement, located adjacent to the company café. Similarly, an outdoor pavilion serves as a unique extension of the workplace, providing a space for informal meetings, brainstorming sessions, and employee lunch. 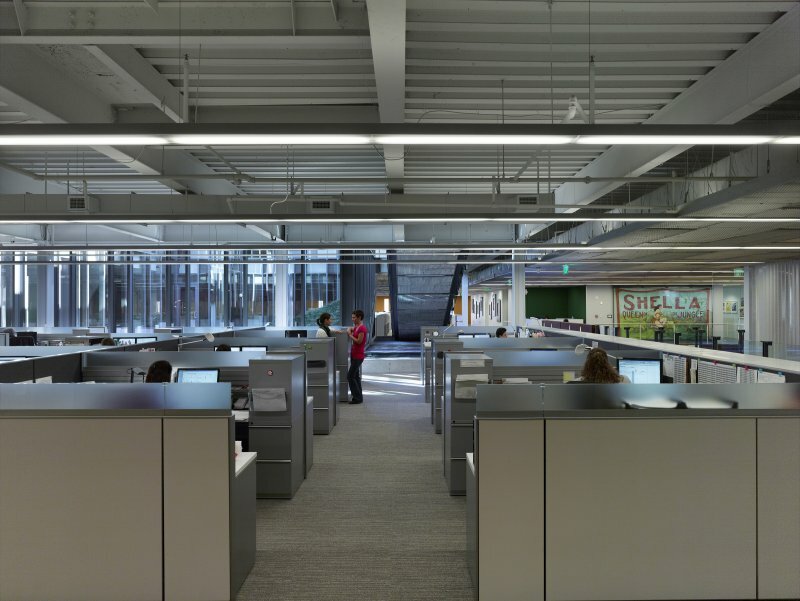 In addition to significantly elevating the frequency of collaboration and interaction within the organization, an equally important outcome of this project was the sheer increase in employee happiness. The quality of the work environment, with enhanced amenities, such as the central café and private nursing area for mothers bringing their infants to work, contribute immensely to overall employee satisfaction.